I have a way of blithely saying ” …and then I served it over brown rice…” as if it is the most obvious thing in the world that one has cooked rice available. Well – this is because I usually do. 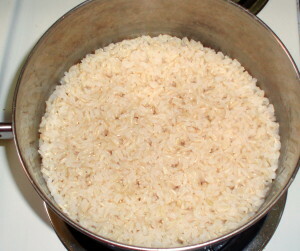 When I cook rice, I make enough for several meals (for the two of us,) and then reheat it in the microwave. 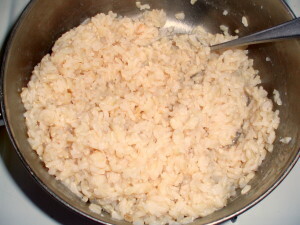 But rice, even brown rice, is very easy for me, because I have a rice cooker. I can set it up pretty much whenever I remember to, pay no more attention, and have nice hot cooked rice for dinner. 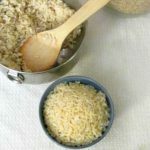 I ate rice regularly before I had the cooker, though – so I thought I should pass on the basic method I learned – and a recipe for a more interesting rice as side dish – a pilau. Brown rice isn’t really all that complicated – and if you have a way you like to cook it, just keep doing that. 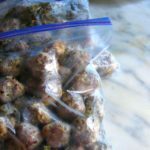 But I know some people have trouble getting it fully cooked without the risk of burning – this can be affected by your pot, or the heat on your stove, or… and this technique will help with that. I use 2 1/2 cups of water to one cup of rice. 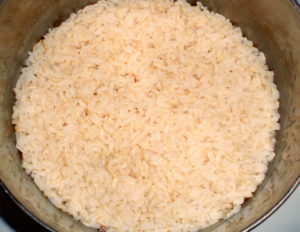 Put the rice and water in the pot, bring it to a boil, lower the heat as far as you can, cover, and let simmer for 40 minutes. (If you have a history of it burning, you may want to check even a bit earlier.) Turn off the heat. Now, look at it. There shouldn’t be any water really visible at the top – if there is very obvious water, give it another couple of minutes. When you tip the pan, though, there should be some water not yet absorbed. Cover the pot, and let it sit off the heat for 10 minutes. At that point, the top should look a little drier, and there shouldn’t be any water when you tip it. If there still is any, let it sit until all is absorbed – and, next time, leave it on the heat another minute or two, before removing it. 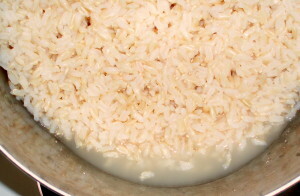 Once the rice is dry, fluff it a bit to allow steam to escape – it can now be served, or wait, with the cover on, up to 10 minutes until the rest of the meal is ready. Once you’ve done this a few times – on your stove, with your saucepan – you won’t have to check for the water, and you’ll know what your timing is. 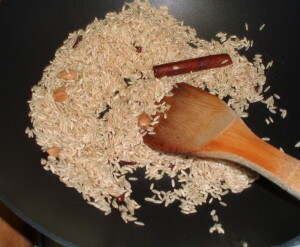 Eventually – just cook 40 (or whatever) minutes, turn off the heat (remove the pot from an electric burner,) keep it covered tightly – and your rice will be ready. The last 10 minutes of steaming makes a big difference. That’s a basic rice. I can make a more interesting recipe, though, especially if I want it on the side, without any sauce. 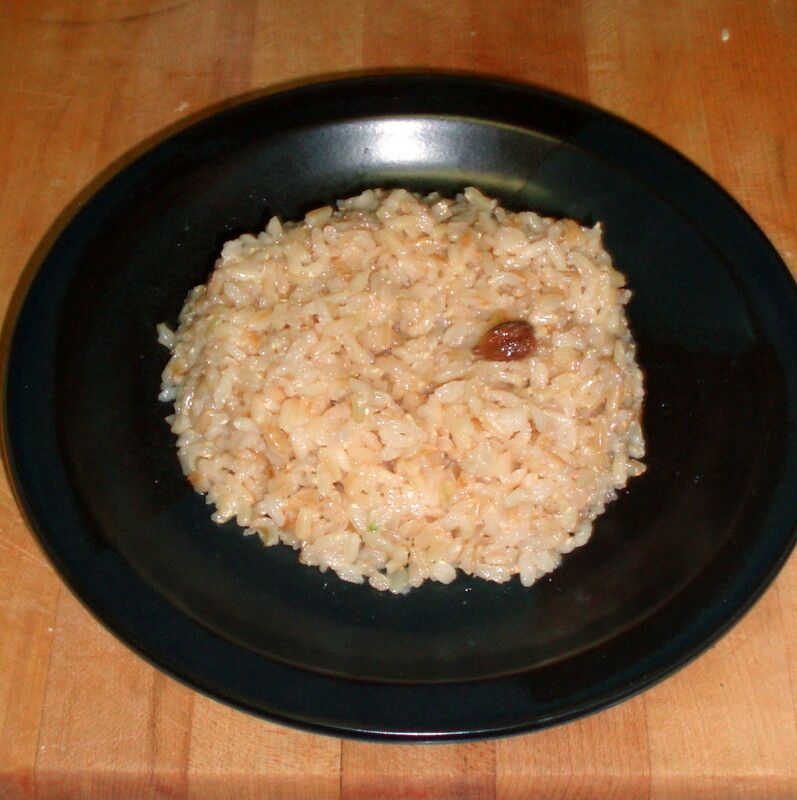 One way is a pilaf, or pilau. 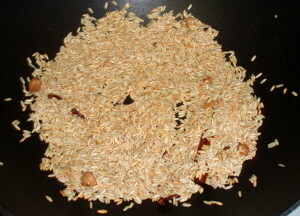 These are essentially the same method – you brown the rice first in oil or butter, than add seasonings, if desired, and cook. 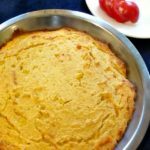 The browning gives it a nutty taste – my mother used to do this, without any seasoning, with brown rice for a specific recipe, and I loved the rice even more than the rest of the food! This is a basic one that would go well with Indian food – or, for that matter, a plain grilled pork chop or chicken breast… I decided to use butter, for the flavor, though that meant I had to be careful not to burn it – oil is easier. I melted it, and then added whole spices – cardamom pods, cloves, and a stick of cinnamon. I heated them for a few minutes in the butter, then added rice. 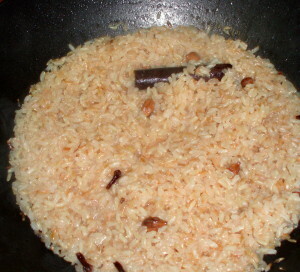 I stirred the rice around to coat it in the seasoned butter, then let it rest a while to brown. 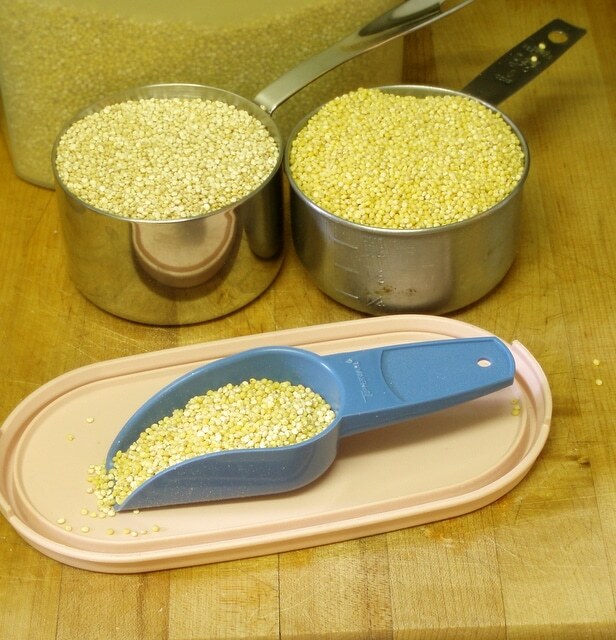 Repeated that step every couple of minutes – I want the kernels of rice to brown. If you look at the picture, you can see how it works – the individual kernels start browning, so you have flecks of brown in the beige mass. I continued that step for 10 minutes, then added water. Stand back, as it will steam when it hits the hot pan! Then I lowered the heat, and let it simmer. Like the basic rice, I simmered it for 40 minutes, then covered it and let it rest for another 10. Melt the butter in a pan. Add the spices, and heat, stirring. Add the rice, and stir. Continue to heat over medium heat for 10 minutes, stirring every 2 minutes. Add water. Lower heat to simmer. Cook for 40 minutes.